In the early 1960s, a collaborated effort between the Pillsbury Company, NASA, and the U.S. Army Laboratories began with the objective to provide safe food for space expeditions. People involved in this collaboration included Herbert Hollander, Mary Klicka, and Hamed El-Bisi of the United States Army Laboratories in Natick, Massachusetts, Dr. Paul A. Lachance of the Manned Spacecraft Center in Houston, Texas, and Howard E. Baumann representing Pillsbury as its lead scientist. In order to ensure that the food that would be sent to space was safe, Lachance imposed strict microbial requirements, including pathogen limits (including E. coli, Salmonella, and Clostridium botulinum). Using the traditional end product testing method, it was soon realized that almost all of the food manufactured was being used on testing and very little was left for actual use. It was realized that a new approach was needed. 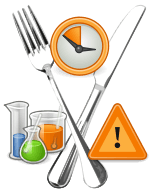 NASA's own requirements for Critical Control Points (CCP) in engineering management would be used as a guide for food safety. CCP derived from Failure mode and effects analysis (FMEA) from NASA via the munitions industry to test weapon and engineering system reliability. Using that information, NASA and Pillsbury required contractors to identify "critical failure areas" and eliminate them from the system, a first in the food industry then. Baumann, a microbiologist by training, was so pleased with Pillsbury's experience in the space program that he advocated for his company to adopt what would become HACCP at Pillsbury. Soon thereafter, Pillsbury was confronted with a food safety issue of its own when glass contamination was found in farina, a cereal commonly used in infant food. Baumann's leadership promoted HACCP in Pillsbury for producing commercial foods, and applied to its own food production. This led to a panel discussion at the 1971 National Conference on Food Protection that included examining CCPs and Good Manufacturing Practices in producing safe foods. Several botulism cases were attributed to under-processed low-acid canned foods in 1970-71. The United States Food and Drug Administration (FDA) asked Pillsbury to organize and conduct a training program on the inspection of canned foods for FDA inspectors. This 21-day program was first held in September 1972 with 11 days of classroom lecture and 10 days of canning plant evaluations. Canned food regulations (21 CFR 108, 21 CFR 110, 21 CFR 113, and 21 CFR 114) were first published in 1969. Pillsbury's training program to the FDA in 1969, titled "Food Safety through the Hazard Analysis and Critical Control Point System", was the first time that HACCP was used. HACCP was initially set on three principles, now shown as principles one, two, and four in the section below. Pillsbury quickly adopted two more principles, numbers three and five, to its own company in 1975. It was further supported by the National Academy of Sciences (NAS) that governmental inspections by the FDA go from reviewing plant records to compliance with its HACCP system. A second proposal by the NAS led to the development of the National Advisory Committee on Microbiological Criteria for Foods (NACMCF) in 1987. NACMCF was initially responsible for defining HACCP's systems and guidelines for its application and were coordinated with the Codex Committee for Food Hygiene, that led to reports starting in 1992 and further harmonization in 1997. By 1997, the seven HACCP principles listed below became the standard. A year earlier, the American Society for Quality offered their first certifications for HACCP Auditors. (First known as Certified Quality Auditor-HACCP, they were changed to Certified HACCP Auditor (CHA) in 2004.). HACCP expanded in all realms of the food industry, going into meat, poultry, seafood, dairy, and has spread now from the farm to the fork. These are actions to be taken when monitoring indicates a deviation from an established critical limit. The final rule requires a plant's HACCP plan to identify the corrective actions to be taken if a critical limit is not met. Corrective actions are intended to ensure that no product is injurious to health or otherwise adulterated as a result if the deviation enters commerce. Verification also includes 'validation' – the process of finding evidence for the accuracy of the HACCP system (e.g. scientific evidence for critical limitations). The HACCP regulation requires that all plants maintain certain documents, including its hazard analysis and written HACCP plan, and records documenting the monitoring of critical control points, critical limits, verification activities, and the handling of processing deviations. Implementation involves monitoring, verifying, and validating of the daily work that is compliant with regulatory requirements in all stages all the time. The differences among those three types of work are given by Saskatchewan Agriculture and Food. The seven HACCP principles are included in the international standard ISO 22000 FSMS 2005. This standard is a complete food safety and quality  management system incorporating the elements of prerequisite programmes(GMP & SSOP), HACCP and the quality management system, which together form an organization's Total Quality Management system. Other Standards, such as Safe Quality Food Institute's SQF Code, also relies upon the HACCP methodology as the basis for developing and maintaining Food Safety (Level 2) and Food Quality (Level 3) Plans and programs in concert with the fundamental prerequisites of Good Manufacturing Practices. Training for developing and implementing HACCP Food Safety management system are offered by several quality assurance companies. However, ASQ does provide a Trained HACCP Auditor (CHA) exam to individuals seeking professional training. In the UK the Chartered Institute of Environmental Health (CIEH) and Royal Society for Public Health offer HACCP for Food Manufacturing qualifications, accredited by the QCA (Qualifications and Curriculum Authority). The use of HACCP for water quality management was first proposed nearly 20 years ago. Thereafter, a number of water quality initiatives applied HACCP principles and steps to the control of infectious disease from water, and provided the basis for the Water Safety Plan (WSP) approach in the third edition of the World Health Organization (WHO) report, which has been described as "a way of adapting the HACCP approach to drinking water systems". Programme Modernization: According to Ongley, 1998, a series of steps could be taken to execute a more useful transition – from technical programmmes to policy to management decisions. Various aspects of the modernization process have been discussed by Ongley in ESCAP (1997). Policy reform - A consultative process must define all the policy tenets and should review the execution of the said policy tenets. Legal reform – Legal reform with respect to water quality management is one of the most crucial elements. This could be addressed by the creation of national data standards as well as the creation of a national process to analyze and review collected data. Institutional reform – This is a complex issue and has got no simple answers. Still, there are some key principles that can be helpful for institutional reform in the light of water quality management. One of them is water quality monitoring as a service function. Apart from that, both technical efficiency and capacity issues emerge as major factors in a reformed water quality programmes. Technical reform – This is one area that garners the most attention as well as investment. However, such a kind of reform most targets facility modernization, including other co-factors like data programmes/networks, technical innovation, data management/data products and remediation. Hazards associated with water systems in buildings include physical, chemical and microbial hazards. In 2013, NSF International, a public health and safety NGO, established education, training and certification programs in HACCP for Building Water Systems. The programs, developed with the guidance of subject matter experts Aaron Rosenblatt and William McCoy center on the use of the use of HACCP principles adapted to the specific requirements of domestic (hot and cold) and utility (HVAC, etc.) water systems in buildings, in order to prevent plumbing-associated hazards from harming people. Hazards addressed include scalding, lead, and disinfection byproducts as well as a range of clinically important pathogens, such as Legionella, pseudomonas, non-tubercular Mycobacteria (NTM), acinetobacter, Elizabethkingia and Naegleria. Early adopters of HACCP for Building Water Systems include leading healthcare institutions, notably Mayo Clinic (Rochester, MN). ISO 22000 is like a standard designed to help augment HACCP on issues related to food safety. Although several companies, especially big ones, have either implemented or are on the point of implementing ISO 22000, there are many others which are hesitant to do so. The main reason behind that is the lack of information and the fear that the new standard is too demanding in terms of bureaucratic work, from abstract of case study. ↑ MIL-STD-105 official record Archived 18 October 2004 at the Wayback Machine. ↑ International HACCP Alliance. "International HACCP Alliance" (PDF). Retrieved 12 October 2007. ↑ FAO/WHO; Richard Jackson. "FAO/WHO guidance to governments on the application of HACCP in small and/or less-developed food businesses" (PDF). Retrieved 14 October 2007. 1 2 3 4 5 6 7 Sperber, William H.; Stier., Richard F. (December 2009). "Happy 50th Birthday to HACCP: Retrospective and Prospective". FoodSafety magazine. pp. 42–46. Retrieved 11 January 2015. ↑ FDA.gov Regulations on acidified and low-acid canned foods. – accessed 10 January 2010. Archived 27 December 2009 at the Wayback Machine. ↑ Newcomb, William O. "ASQ Certification: A Brief History". Quality Progress. January 2010. p. 43. ↑ American Society for Quality Certified HACCP Auditor brochure. – accessed 9 January 2010. ↑ "SQF Code, Ed. 7.2" (PDF). SQF Institute. Retrieved 22 April 2015. ↑ TQ Vision. "Welcome to TQ Vision". Retrieved 9 October 2007. ↑ International Certifications Limited. "International Certifications". Retrieved 9 October 2007. ↑ "HACCP Accreditation Service". aibonline.org. Archived from the original on 6 June 2010. Retrieved 6 June 2012. ↑ American Society for Quality. "HACCP Auditor Certification - CHA". Retrieved 9 October 2007. ↑ CIEH. "Chartered Institute of Environmental Health (CIEH)". Archived from the original on 25 February 2009. Retrieved 25 March 2009. ↑ CIEH. "Qualifications Curriculum Authority". Archived from the original on 15 March 2009. Retrieved 25 March 2009. ↑ Food and Drug Administration. "Fish and fisheries products hazards and controls guidance, third edition". Archived from the original on 29 September 2007. Retrieved 14 October 2007. ↑ Food and Drug Administration. "(draft) Guide to minimize microbial food safety hazards of fresh-cut fruits and vegetables" (PDF). Retrieved 14 October 2007. ↑ Food and Drug Administration. "Guidance for Industry: Juice HACCP Hazards and Controls Guidance, First Edition". Archived from the original on 17 September 2007. Retrieved 14 October 2007. ↑ Food and Drug Administration. "Managing Food Safety: A HACCP Principles Guide for Operators of Food Establishments at the Retail Level (Draft)". Retrieved 14 October 2007. ↑ Food Safety and Inspection Service. "FSIS Microbiological Hazard Identification Guide For Meat And Poultry Components Of Products Produced By Very Small Plants". Retrieved 14 October 2007. ↑ United States Department of Agriculture. "Guidance for school food authorities: developing a school food safety program based on the process approach to HACCP principles" (PDF). Retrieved 14 October 2007. ↑ Havelaar, A.H. (3 November 1994). "Application of HACCP to drinking water supply". Food Control. 5 (3): 145–152. doi:10.1016/0956-7135(94)90074-4. ↑ Guidelines for Drinking-water Quality (PDF) (Report). World Health Organization (WHO). 2004. ↑ Rosén, Lars; Hokstad, Per; Lindhe, Andreas; Sklet, Snorre; Røstum, Jon (June 2007). Generic Framework and Methods for Integrated Risk Management in Water Safety Plans (PDF) (Report). Techneau. Canadian Food Inspection Agency Contains free templates and guides for HACCP programs to meet Canadian Food and Drug Regulations for the public but targeting federally registered establishments.